"Inspiration Mosaic" is now available for purchase, click here to find it and the rest of our new release stuff in the Gina K Designs store! This new set is kind of a blank canvas to use however you see fit, the only limits are your imagination. It's a little Frank Lloyd Wright, a little Mondrian, (a little "Partridge Family!" LOL! ), this large frame can suit MANY different styles. Use it as a framework and let you imagination go wild. You need some inspirational quotes to go with of course! 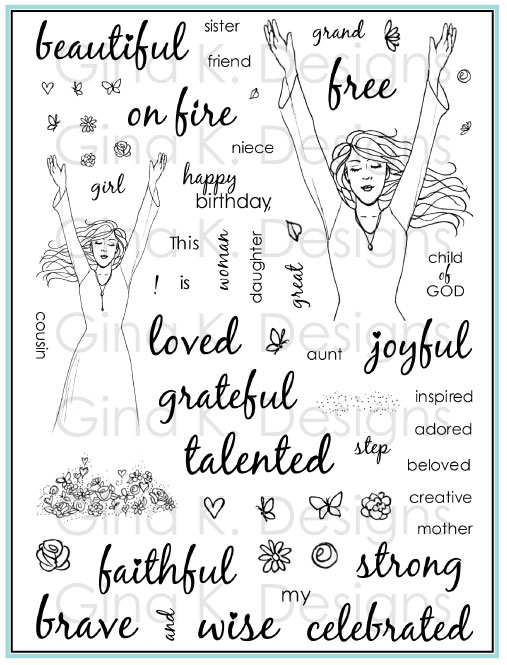 These are a few of my faves that go so well with the occasions you like to honor with cards. This font looks fabulous with everything! The frame stamp works like a perfectly composed sketch you can use FOUR ways, turned vertically or horizontally, left or right. 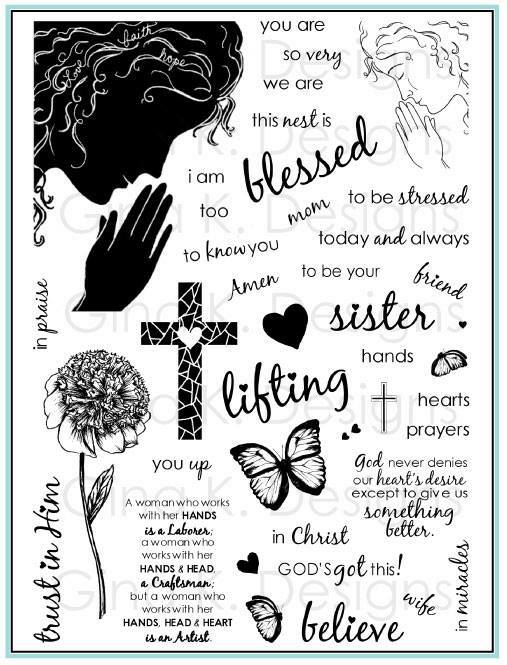 This lovely layout follows the rule of thirds and had two boxes positioned on the "top layer", perfectly sized for any of the greetings or sentiments in this set, as well as to make a frame around your favorite stamped images. The clean lines and geometric shapes make terrific masculine cards and projects, as well as a base for "clean and simple" cards. 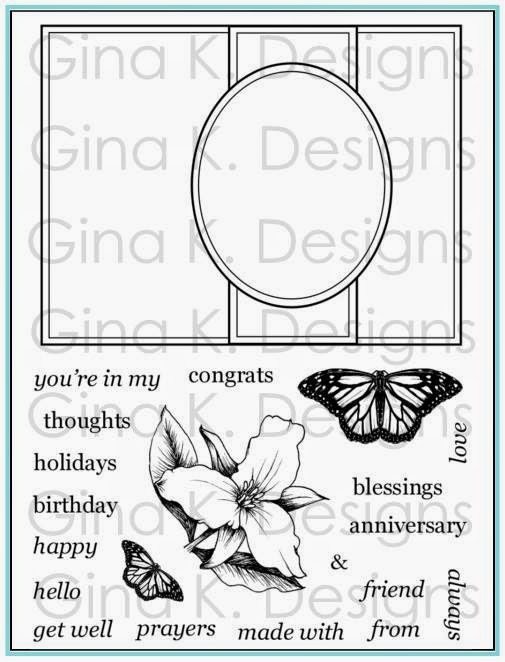 Trim your stamped mat leaving 1/8" around the border to layer onto an A2 sized card. The thin line will make it look like you've added three layers! I actually drew a line onto the plastic guide on my cutter that you slide the paper under 1/8" from the edge. This way I just line up the border with the line and I have a perfect cut every time! Trim it exactly on the edge if you like and layer onto coordinating colors that you've used inside the frame. Try trimming the outside different ways, Jessica made a beautiful "blanket" with it this way by cutting the sides to look like fringe! Quilt for all seasons: paper piece it with coordinating seasonal papers, Christmas, Fall, pastels for Spring, pink, blue and yellow for baby cards. Score it! Stamp the frame on your Cardstock and trace over the lines with your scoring tool(wither putting a straightedge over the line or lining up the lines over the Scor-pal track) Then flip it over and you have a beautiful dry embossed grid. Beautiful and subtle! 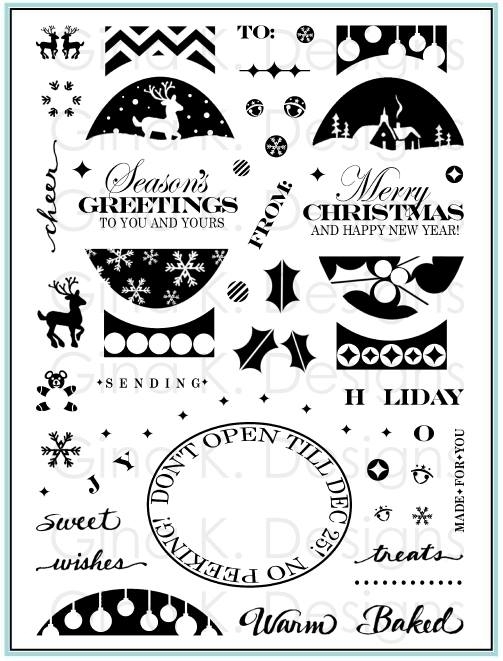 Give the entire stamp a stitched look by stamping the frame in Versamark , then line up the short dashed line from the set with a line on your acrylic grid black. Now line up the line of the block over each line in the image and stamp away for perfect rows of stitching, the result will look like a big patched quilt! You don't always have to keep it a rectangle, cut out the middle clump on boxes cutting out the parts on the corners to have a kind of built up "Lego" section to put on top of your card. Play with cutting out the different areas and layer them in different configurations over the stamp frame to make new interesting patterns. Stamp the frame in Versamark to make a subtle pattern on your colored card front and layer and mat other images over it. Use Encore metallic and dye reinkers on glossy CS for a polished stone background, then stamp the gird over it, will look like a beautiful tiled marble floor! Cracked Glass: Stamp a floral pattern all over the grid and them emboss with several layers of glassy glaze, freeze and crack. the result will look like antique China. 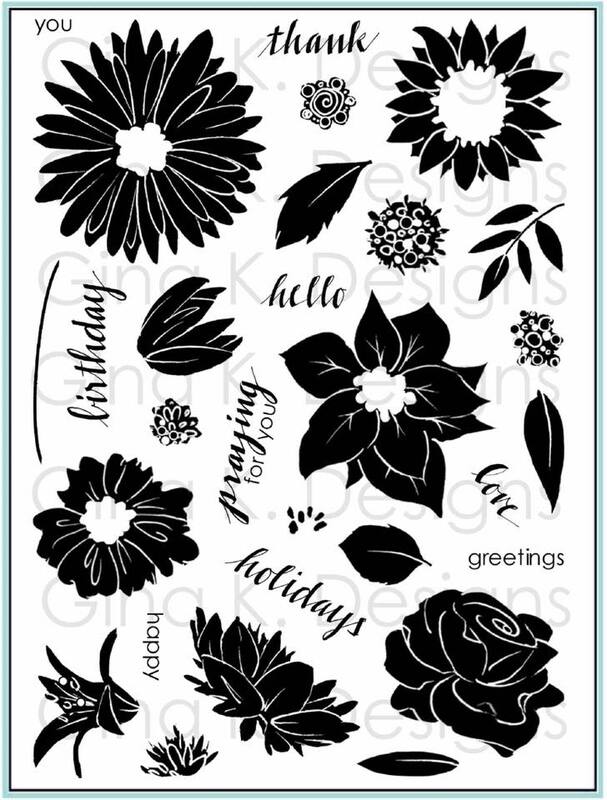 Try stamping it in a color on a lighter colored cardstock and just add greeting, this will achieve a great look without the need to coloring in ANY boxes. Clean and simple! The tiny circle and square can be used a like stampable brads, stamp them anywhere you need a little pop of color! emboss them in a color or metallic powder and you probably won't be able to tell the difference between the stamps and a real brad! Add a little Sakura Glaze pen , clear embossing or Crystal Lacquer over them for shine and dimension. Stamp on white in black ink and colors just some of the boxes for a very clean and simple graphic look. Try it with any of your favorite color combos or challenges. Sponge ink into the different areas after masking for a beautiful effect. Stamp it onto DP and add a greeting. Layer the different boxes with coordinating colored CS mats for some contrast, or, do this in reverse! Paper piece the different boxes, you come up with a very intricate layered pattern without having to measure any mats! Quilt without cutting: stamp the grid onto a light patterned DP. Choose two to three colors from the paper and color in a few of the boxes with each. Your pattern will show through and now it looks like you have three coordinating prints in different colors! Place embellishments like flowers, buttons, brads at the corners and intersections of the boxes. Mask your favorite images into the different boxes overlapping the edges, this gives your images such a fresh, fun look! Peek a boo! Pierce or draw dots on the lines or around the corners of the boxes where they meet to add an interesting detail. Pop up the top boxes to give it dimension. Cut out the boxes to have things underneath them or create a window into your card. Trace the underside of the boxes with a pale gray marker: this will give the illusion of shadows like the boxes are really dimensional tiles overlapping on different levels. 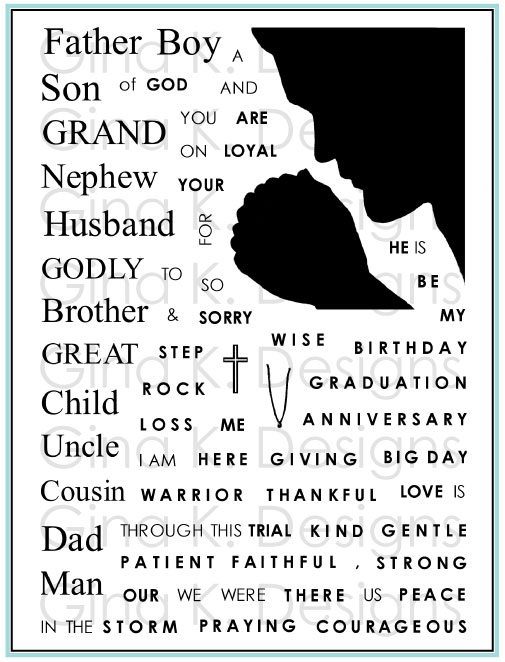 Use the little dotted and shaped lines above and below your sentiments in the corners and around the different frames. Use the little elements together to create fun new borders. 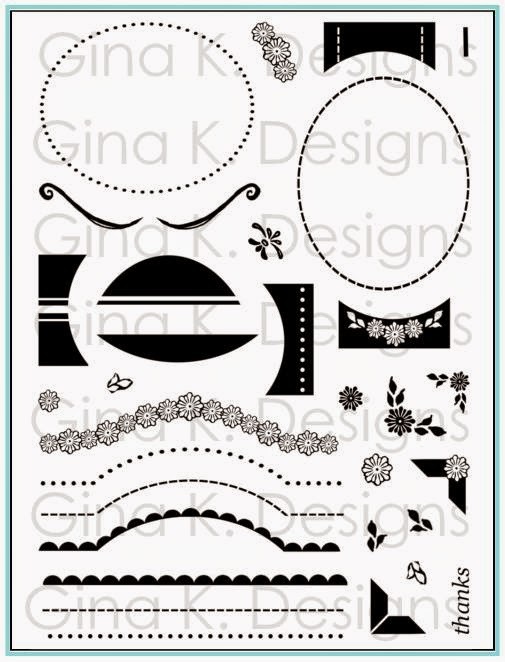 Try the the solid circle or outline to make a scalloped border like Kurtis did, under a mat! Use the dashed line to look like stitching or dotted line to look like piercing! Collage stamp different images from one set all over the stamped grid and then color just portions, this will make the images look like they are on different layers and spotlight certain areas. Stamp a large image over several sections and color each part of the image a different way. 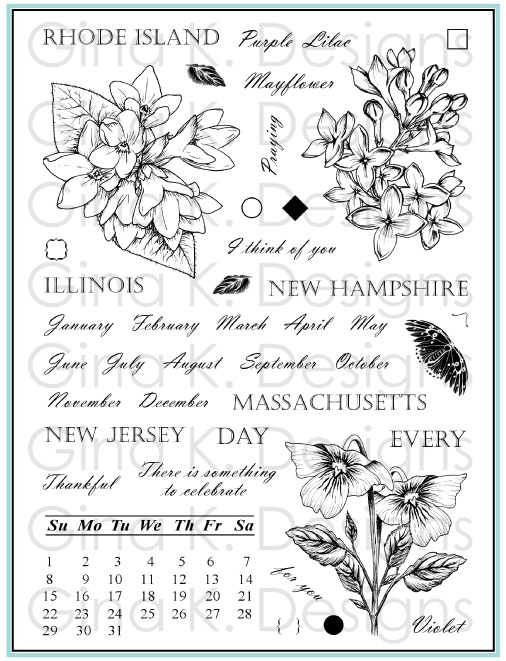 See sample above using "A Year of Flowers"! Or, leave the line art image blank inside and color around the outside of, for a "negative effect". Stamp the background onto pictures you like in magazines and piece it all together. Stamp onto two pieces of CS, emboss with two of your favorite Cuttlebug folders, and piece them together, mixing the two textures. Layer punched corners and flourishes over the corners or split up mats for behind the frame for a different look. Cut a slit on either side of box to thread your ribbon under , this will make your stamped image or greeting in the box look like a tag or slide. 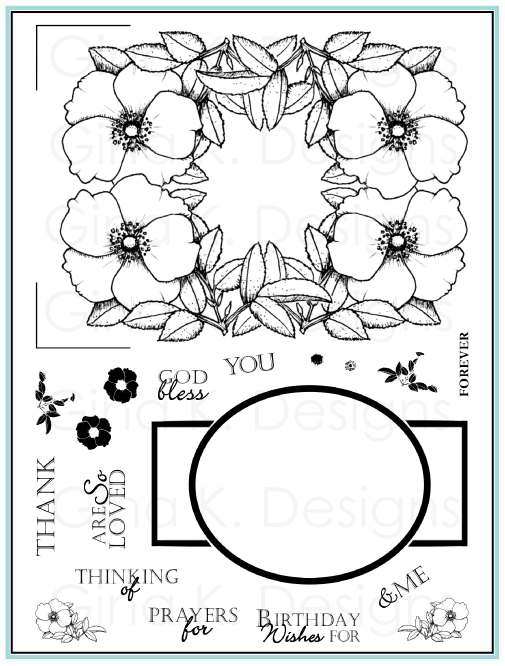 Punch the line art and bold circle and squares out with a 1/2" or 3/4" punch and layer onto the mats to add interest or balance out the images you've stamped into the layout where ever you need a little something! Use the small shapes to create cool geometric patterns within the boxes or on your other cards! Stamp the circles and squares directly onto the frame to make the pattern more intricate. Color the new intersecting areas with different colors. Take large and small images and stamp them into the different boxes, it will look like they are all on display so to speak, in a collection. 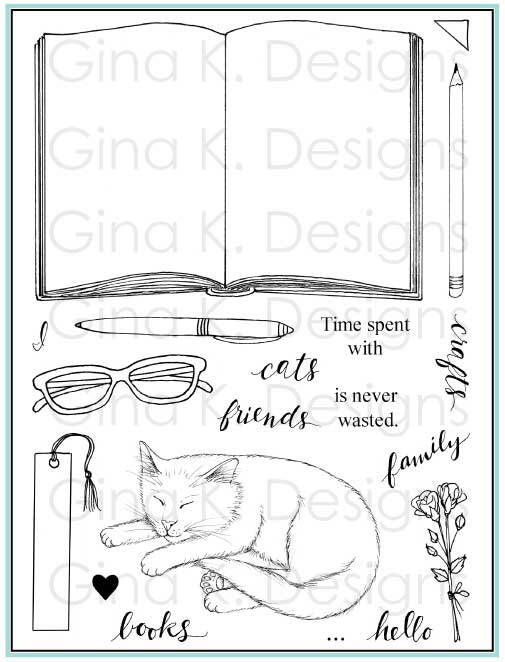 Projects: Stamp over a favorite landscape, sunrise, sunset photo and add a quote to one the boxes for a very artsy looking mat for a card, a piece to frame or create your own postcard! Make fun mini scrapbook pages or a card with a photo by layering a photo over the stamped mat and then journaling into the other boxes or adding a few embellishments to accent them, an easy layout! Stamp a monogram into one of the boxes for personalized notecards! Stamp it on acetate or clear Polyshrink to create a miniature stained glass "window"! Create quick, cool gift wrap by stamping the frame over and over on a large piece of paper, with the rectangles intersecting, then color just tiny portions for a really cool look! This is just the beginning! I have samples ALREADY for almost all of these tips and have many more ideas I will be sharing soon! ALREADY ordered it!!! LOL I LOVE this set! Great job!!!! 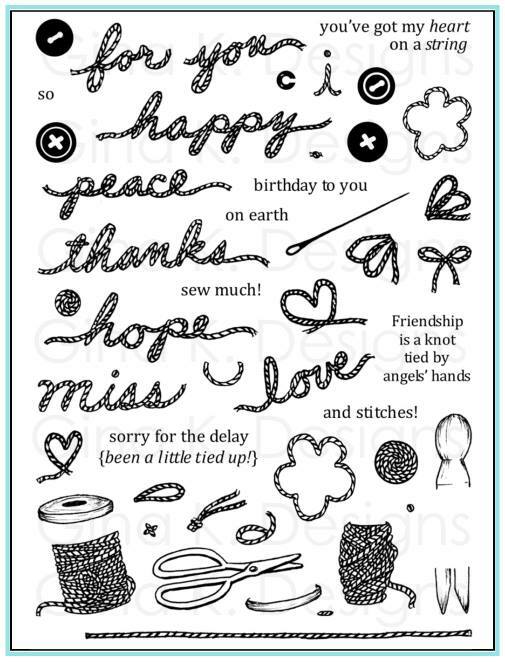 Melanie thank you so much for all the ways to use this stamp set! You are amazing! A woman from church brought a quilt last night for us to pray over before she gives it away. She is starting a quilt ministry. I was thinking this set would be great to make a card to go with the quilt. Thanks for your fabulous ideas! Gosh Mel.. Another really AMAZING card.. I am LOVING the "stained glass effect..
thanks Melanie - keep those ideas flowing! Interest take on making a card...I really like it! wOW Melanie I couldn't help but stop in to comment of this card! Super pretty! OMG Melanie, how wonderful that you have given us all these great ideas for ways to use this fabulous stamp! 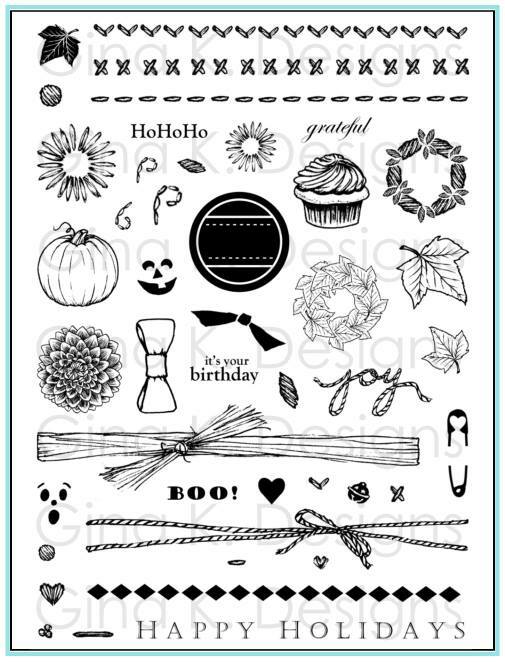 I am blown away with all the ideas and can hardly wait until I can save up enough to purchase this stamp set! You are one artistic lady! Thanks! OK ... so I am late to this Inspiration Mosaic Tip Sheet ... I recently got the stamp and want a crash course on this stamp (and ideas for the stamp from the BOSS)and that I feel this stamp will be my most very favorite stamp ever. Versatility in a BIG way!! THANKS!! Sneak Peek: Free with Three "Tropical Windows"
You Dropped the Bomb on Me...!